Citadel Outlets is a large outdoor outlet mall in Los Angeles, CA. Most malls are open after sunset which means that a lot of these retail stores will have illuminated signage since the storefronts are outside. Especially in a mall, you want to have your sign illuminated to attract customers as you’re always in competition with the other stores. 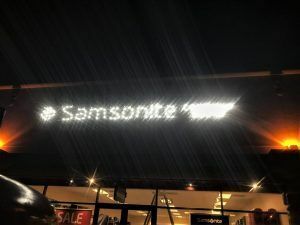 Samsonite at the Citadel Outlets had a set of reverse-lit channel letters for their storefront. We performed an LED retrofit for them by switching their neon out with LEDs. In the past, neon was the go-to for illuminated signs. 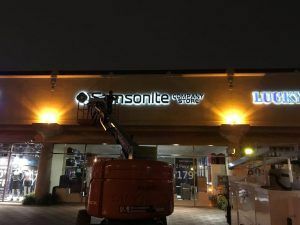 Custom bent neon signs with exposed tubes give a cool look for certain types of signs but for signs that are internally illuminated, many business owners are calling sign companies like us to convert their sign to LEDs. There are many different reasons why a business would want to get an LED retrofit. Neon signs can use up to 9,000 to 15,000 volts while LEDs only use 12 volts. (source) Not only does this mean that LEDs are less of a fire hazard, you will also be saving money on your electric bill. This is a great benefit for businesses that are open after sunset and require their outdoor signage to be illuminated for several hours a day. Although the initial cost of LEDs are more than neon, you will definitely save money in the long run due to the energy efficiency. LEDs are generally easier to take care of. Especially in the sign industry where we are delivering the signs to our customers and installing them, a fragile neon tube is more of a hazard than LEDs. Neon can also illuminate unevenly if the gas inside leaks, which can definitely happen over time and give your storefront sign an unprofessional look. Replacing one burnt out LED is much easier than getting a new neon tube. Rather than illuminating 360 degrees, LEDs illuminate in a specific direction which is great for channel letters. When we make a front-lit channel letter, only the face is translucent and the rest of the channel letter is made from aluminum. For reverse-lit channel letters, only the back of the channel letter is clear so the wall can be illuminated to create a halo effect around each letter. In either case, we only need illumination to be facing a specific direction. The directional illumination is more efficient in this case because we are only using energy where is needs to be used.